For centuries, people have relied on the blue-green algae found off of coastlines for food. Over the years, natural medical practitioners have come to recommend various types as folk remedies for illnesses and disease. One of the most commonly used varieties of blue-green algae is spirulina. Many types of spirulina supplements are available on the market. These include organic varieties that come from algae raised without the use of chemical pesticides or fertilizers. Spirulina is rich in protein. It is often used as a supplement for those who need more protein in their diets due to deficiencies or rigorous exercise regimens. The algae also contain high amounts of vitamins and minerals including iron and are a source of gamma linolenic acid (an essential fatty acid). Some people use it as a supplement to bridge dietary gaps. Spirulina may offer some promising health benefits. However, more scientific research is needed to determine whether or not it can be beneficial for any use beyond a nutritional supplement. If you wish to add spirulina to your diet, you'll find multiple high quality options at Walgreens. From supplements to nutrition bars, the herbs department includes many solutions to meet your dietary needs. If you are pregnant or nursing, do not take spirulina. The effects on developing babies and infants are unknown. Because spirulina has the potential to strengthen the immune system, you should not take it if you have any type of auto-immune disease (a condition where the immune system attacks the body). These include multiple sclerosis (a disease that affects the nerves) and rheumatoid arthritis (a disease of the joints). The herb could also counteract the effects of drugs meant to suppress the immune system. Spirulina contains the amino acid phenylalanine and should not be taken by anyone who is sensitive to the nutrient. 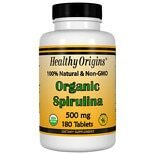 Consult your doctor before taking an organic spirulina supplement.